Published: October 14, 2017 10:21 am Updated: Oct. 14, 2017 1:05 p.m.
Mary Wood's been at Stony Point Ward building where she sought refuge since wildfires in Northern California blazed through wine country earlier this week. The Santa Rosa, California, resident was woken up at 2:45 a.m. Monday by a call from her son across town saying there was a fire in the area, she told the Deseret News. "We went outside, saw the flames and immediately went over to our church," said Wood, a member of The Church of Jesus Christ of Latter-day Saints. Cars sit among the debris at the Journey's End mobile home park on Monday, Oct. 9, 2017, in Santa Rosa, Calif. Wildfires whipped by powerful winds swept through Northern California early Monday, sending residents on a headlong flight to safety through smoke and flames as homes burned. Wood lives in a mandatory evacuation area and has stayed since Monday evening at the ward building. 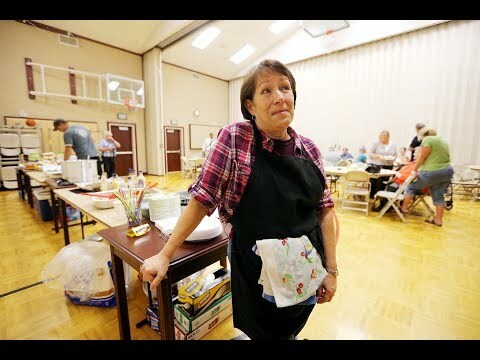 Despite being displaced herself, she said she's volunteered to feed the 20 other permanent residents at Stony Point Ward building with experience from church such as serving food as a Relief Society president. "Isn't that one of the most wonderful things we can do is come together over food?" A firefighter covers his eyes as he walks past a burning hillside in Santa Rosa, Calif., Monday, Oct. 9, 2017. Wildfires whipped by powerful winds swept through Northern California, sending residents on a headlong flight to safety through smoke and flames as homes burned. Wood said volunteers "feel a responsibility" to make the elders staying at the ward building feel comfortable. She she she'd like to be in better circumstances like all other people displaced — but serving people whose homes were lost is the main focus. "I would love to be at home," Woods said. "I want to be around my personal belongings as everyone else here does, but I know my home is safe ... so I just want to be able to serve people." Above is the video story of how disaster can brought out the best in a person facing tragedy herself. No words. This is Santa Rosa. Flames from a wildfire consume a a three car garage at a home Monday, Oct. 9, 2017, east of Napa, Calif. Wildfires whipped by powerful winds swept through Northern California early Monday, sending residents on a headlong flight to safety through smoke and flames as homes burned.